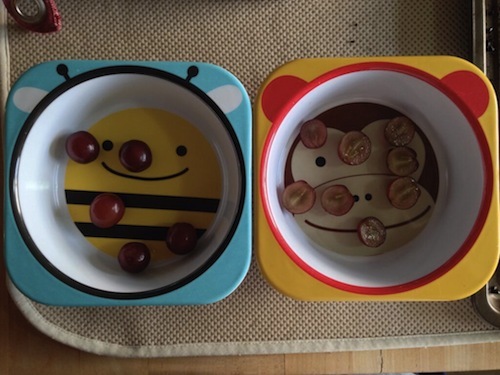 Every once in a while, someone shares with me a lovely story of a conversation that they had with their kid that was inspired by the work on this blog. These stories are tremendously satisfying to me because they remind me that isn’t just me and my kids, and that it doesn’t just come naturally. 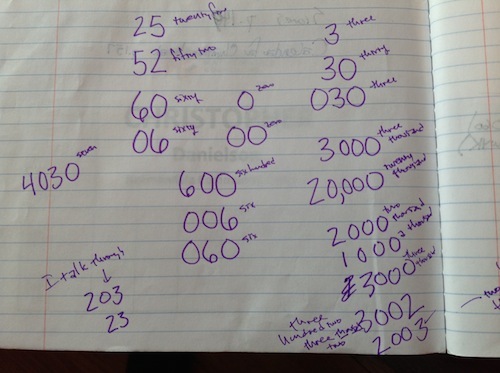 Talking math with your kids is something you can learn. Today’s report is from Zoe Ryder White, whom I have not met, but who heard about this site from a friend of the project, and who gave me permission to share it. [I] used some tidbits already this morning – [My daughter] A. was making a giraffe and wanted each leg to be two wooden spools long. At first she wasn’t sure how many total she’d need, but when I asked how many a giraffe has, she quickly figured out the total was 8. Before reading the talk math with our kids stuff I would’ve probably just said yep, you got it- but we ended up having a great conversation about all the different ways you could figure that problem out. SO FUN. 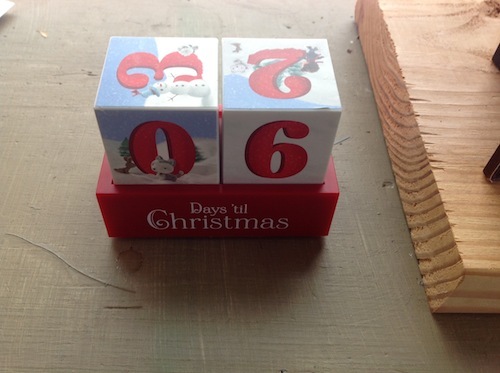 In yesterday’s post, I told of the Christmas Countdown cube calendar, and of how Tabitha (6 years old) changed my 06 days to 6 days by removing the leading zero. I challenged readers to consider her reasons for this. Of course I asked her. I showed her the pictures I took and asked why she had taken off the zero. Here are the results of our conversation. Me: I’m curious about why you took off the zero. Tabitha (6 years old): Because there aren’t sixty days until Christmas. A new piece of research has been making the rounds in the media recently. I will write about it at length soon, but for now you just need to know that the common headline is something like, “Young children know more about place value than most people assume they do.” In particular, the research looked carefully at the partial place value knowledge children have, rather than just calling wrong answers wrong. Helping children develop partial knowledge into better knowledge through exploring and talking is the heart of the work here at Talking Math with Your Kids. Naturally I want to explore Tabitha’s knowledge here. I get out a piece of paper, a pen and write some numbers, asking her to tell me what they are. I write down her responses verbatim so that I can share them with you. A reasonable hypothesis for Tabitha saying that “06” meant “sixty” would be that she doesn’t pay attention to the order of the digits in a number. We now know this isn’t true. Now things are getting interesting. There seems to be something special about that zero out front. We do some more. What? I was sure she was going to say six hundred for this one. No hesitation on this one, which surprises me. I thought she might object to two zeroes. At least this one is consistent with 060. I am beginning to wonder how she will work with numbers that have zeroes in the middle of them, such as 1002. And I am curious how she will work with numbers that use the same words, but in a different order. I think of 1002 and 2001 as a good example: one thousand-two and two thousand-one. So I build up to those. Uh oh. I didn’t expect this. I expected one thousand, not a thousand. I have to change my examples. Beautiful! This is what the researchers were saying—children have partial place value knowledge. What is going on here is this: 3002 looks like 300 with a 2 at the end. This is a very common error, and it represents trying to make sense of a complicated idea. We do only one more; I can tell she is getting tired. I cannot tell if she is being silly or serious, trying hard or being clever. Just as with learning to speak a native (or foreign) language, learning about numbers is not an all-or-nothing proposition. Children have partial knowledge that is sometimes inconsistent. Tabitha self-corrected on 3002, but not on 2003. This conversation supports her thinking about the structure of numbers. She will think about it in the future and be more prepared to pay attention to it because we talked about it. When she wants to know more, she will ask. Children learn about numbers and language in similar ways—through exposure in their everyday environments. We read to our children to enrich their language environment, and we can expose our children to numbers to enrich their math environment. Waffles, toys and calendars are all examples of everyday objects with mathematical structure that children can play with. Have these things available. Ask about how your children play with them. Listen to their answers. Then ask follow up questions. I was in New York City for a conference recently. I arrived at JFK airport on a Monday evening and took public transportation into the city. I observed the following scene. At about 8:30 p.m., a mother and her (roughly) 6-year old twin girls board the train and sit quite near me. Mom opens the first girl’s backpack to check whether her homework has been completed. Child 1: I did it. Oh…on that one, I forgot to write the 6. These are my daughter’s fingers. I did not photograph the children on the subway. Child 1: Two and four is…1, 2, 3, 4, 5, 6! Mom checks a couple of other things and puts the materials back in Child 1’s backpack. She opens Child 2’s backpack. Mom: Why don’t you have a math book? Child 2: I do! It’s Go Math! Child 2: At school. Teacher says it never leaves school. Mom: So you get worksheets? Mom: What’s the point of having a math book, then? Oh well. She flips through the worksheets, but does not discuss their content with the children. The worksheets appear to her (and to me) to be a disconnected jumble, which the child has completed. About ten minutes later, the girls are acting up a little bit. Nothing major, but they are getting loud and silly. They are clearly getting on Mom’s last nerve. Mom has expressed to them how tired she is. Another ten minutes pass, with the girls just barely keeping it together. They get off the train at their stop. A major goal of my writing here and in my book is to help parents notice opportunities to support their children’s mathematical development, and to take advantage of these opportunities. Traditionally as parents, we look over our children’s homework and keep an eye our for errors. We help our children when they are stuck. If everything is correct and complete, we move on. All of that is good. It is important to help our children when they are stuck. It is important to check their homework. All good. I want to point out the opportunity this mother had when her daughter was talking about the neglected six. 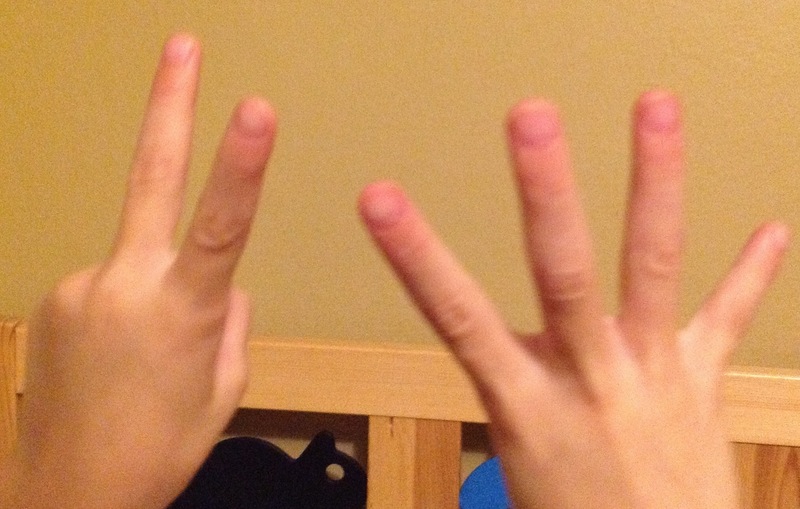 Child 1 said, “I forgot to put the 6,” and then demonstrated the relevant addition problem on her fingers. That conversational technique will bear fruit with kids 95% of the time. When you notice an idea, praise the child for expressing it and ask a follow-up question, the child will nearly always answer that question. If the question suggests that there are multiple answers, the child will usually keep thinking beyond their first idea. (2) less misbehavior later on. Yes it takes energy to carry on a conversation of any kind with your children when everyone is tired. But it takes less energy to do that than to keep them quiet when they don’t want to be. I understand, of course, that not everyone knows how to do this. That is what we’re working on here. This is an example of starting a conversation by listening and asking follow up questions. Some conversations parents initiate. Others children initiate. When children initiate them, the conversation only moves forward if we listen and ask questions. Oh, good! I like that you showed how you know 2 and 4 is 6. 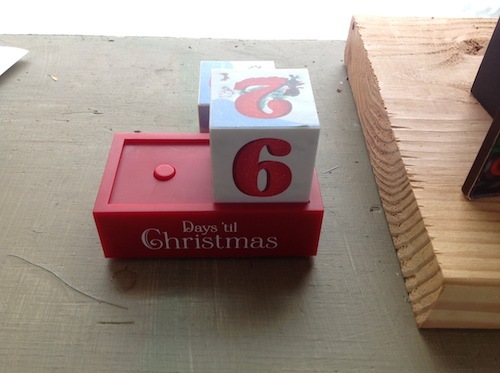 What are some other ways you can make 6?